Hey folks, I’m going to keep this Update very short. In fact we may follow it with a more lengthy one over the weekend or early next week. Here are the highlights you need to know. At the printer. We are so pleased with Bizantium and the Northern Islands™. It is jam-packed with all kinds of new information, details, background, and ideas for adventure. Make sure you read the new description elsewhere in this Update. Taking pre-orders now. We are working on The Rifter® #69 right now. It should go to the printer by the end of next week. It includes material for Rifts®, Chaos Earth®, Heroes Unlimited™ and After the Bomb®, G.M. tips and more. Most of the artwork is done. Layout is next. The Chuck Walton cover is action-packed. So will be the source material to be included in this next issue. We expect to dive into production of The Rifter® #70 very soon for an end of April release. 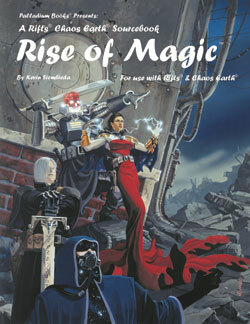 Chaos Earth® Rise of Magic™ pre-orders shipped last week and it is available now. 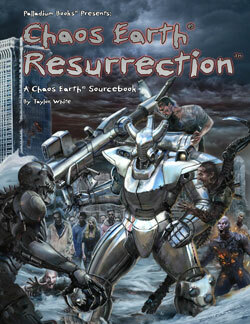 And watch for Chaos Earth® Resurrection™ and Chaos Earth® First Responders coming this spring and summer. Holy cow, is Chuck Walton’s cover awesome! That should give you a hint of what’s to come in the Chaos Earth® Resurrection™ sourcebook. It’s coming, it’s coming. In fact, we’re working on many ideas for Robotech® products this year. Keep your eyes peeled. Thank you for making this one of our most successful subscription drives. Welcome to the many new subscribers. Robotech® RPG Tactics™ has been shipping to our European Kickstarter backers for the last couple days, and based on the tracking numbers we’ve been sent by the warehouse, at least half of them have gone out. The rest should ship the first day or two of next week. We hope you love it. Robotech® RPG Tactics™ should start shipping to our Australian Kickstarter backers and the rest of the world in another two weeks or so. At last! Nobody is happier about this than us. Yikes, what an ordeal to get this into everybody’s hands. We are working on a number of things we think will make Robotech® RPG Tactics™ fans happy. We hope to do a big update soon. The initial launch of Robotech® RPG Tactics™ is just the first step. We have years of exciting plans for RRT. More game pieces for the Macross saga, expanded rules, new faction, tournaments, and, of course, the Wave Two release. We’ll provide much more insight soon. Meanwhile, gamers are having a blast building and painting Robotech® RPG Tactics™ game pieces and playing the game. So please spread the word, and talk the game up, because we want to make Robotech® RPG Tactics™ truly epic and fun with countless avenues for battles and scenarios. For those of you who haven’t tried Robotech® RPG Tactics™ yet. Take a look and join the thousands of people who are already building, painting and playing right now. In fact, you can check it out at ApdetiCon, Arcticon, Penguicon, the Palladium Open House, Gen Con and many other events coming this year. Robotech® RPG Tactics™ truly captures the fast movement and fun of the Robotech® anime and many novels, games and comic books that have followed. And more will be coming. Much more. The FREE Robotech® RPG Tactics™ Color Guide Resource is available on DriveThruRPG.com right now, and has been very well received. Please spread the word about the Color Guide and an ever increasing number of comprehensive building instructions. Robotech® RPG Tactics™ Tournament – Battle for Macross City – It’s big. It’s fun. There are prizes. Register now to make sure you get to play. We’ve been told the more people who register, the bigger the event will become. This epic tournament will be 300 points and have several games with fantastic scenarios. Each table shall be a beautiful custom creation, for a unique gaming experience. Five different awards will ensure that no matter what aspect of the hobby you are most interested in, there is an award that will be for you. This tourney is for all levels of players, from first time tournament and convention attendees to the seasoned gamer. Experience first-hand the fun, fast-paced game of Robotech® RPG Tactics™. Palladium has added PenguiCon to its convention schedule – April. We’ll be there selling Robotech® RPG Tactics™, our latest book releases and other select RPG titles. Chuck Walton will be present selling original art and prints too. And since the Palladium warehouse is only 30 minutes away, tell us your special wants, and we can have them there later that evening or the next day. Cool. Hope to see some of you there. UPDATE: DriveThruRPG.com – Bizantium Sneak Preview coming this weekend – plus FREE Robotech® RPG Tactics™ color guides, detailed, additional comprehensive RRT building instructions, The Rifter® #60 and more are available now with more coming. 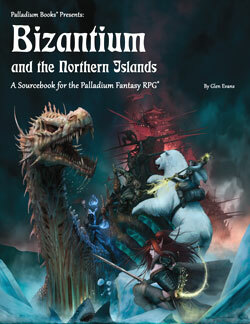 The Palladium Fantasy Bizantium and the Northern Islands free preview should go up this weekend along with a few other things. Palladium continues to provide FREE support to Robotech® RPG Tactics™ with supplemental material (and this is just the beginning). So far that includes some game cards, the massive mecha painting/color design templates (more than 100 images in color and black and white – and an awesome resource for any Robotech fan), and some detailed assembly instructions, with MUCH more coming. There is much more to come for Robotech® RPG Tactics™ and other Palladium game lines. 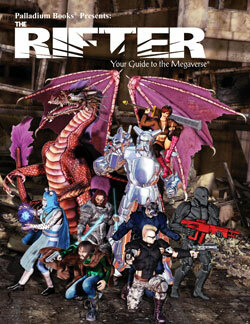 The Rifter® #60 has also been added to titles available. Much, much more is coming in the weeks ahead for Robotech® and other Palladium game lines. We plan to add a bunch of new material to DriveThruRPG.com over the next several weeks, so keep an eye on it. DriveThruRPG.com already offers 90+ Palladium Books titles available as PDFs with more to be made available soon. They currently include the Coalition Wars®/Siege on Tolkeen™ series, Splicers® RPG, The Rifter® issues #1-60 (with more being added soon), and first edition rules of the Rifts® RPG, Beyond the Supernatural™ RPG, Heroes Unlimited™ RPG, The Palladium Fantasy RPG®, and related 1st edition sourcebooks for each. And more! Like what? Like Fantasy Paper Miniatures and Game Master Kits for digital download. They are available only as PDF files and were designed special to help you run your games and build campaigns. There are also sneak previews of books and other good stuff. Check it out! And let other gamers know they are available too. We’ll be making more available on DriveThruRPG.com in the weeks and months to come, so take a look on a regular basis. Jolly Blackburn, the mad genius behind the beloved Knights of the Dinner Table comics, HackMaster, and more, tells me he plans to make a rare appearance at the Palladium Open House! And he’ll be bringing a selection of Kenzer Company products to sell. Marvel Comics Spider-Man artist and Palladium fan favorite, Ramon K. Perez, hopes to make it to the POH for at least two days (details to follow). And an unfinished, preliminary schedule of game events will be posted online very soon. As I keep saying, we intend to pull out all the stops and make the 2015 Palladium Open House the best ever! Lots of games run by the very people who make them, meet 30+ Palladium Creators, more panel talks, get autographs, buy original art, one-of-a-kind art items, a Rifts® 25th Anniversary party, live auction and more. Come on over and have the time of your life. IMPORTANT! Please “reserve” your hotel rooms NOW. It helps Palladium immensely. Likewise, please order your admissions sooner than later so we know how many gaming events to schedule. ● TIME SENSITIVE: Reserve your rooms soon for the 2015 Open House Hotel! Your credit card will NOT be charged until May, so there is no reason not to play it safe and reserve your room. Note: Hotels within a 20 mile area WILL BE BOOKED due to a sporting event the same weekend. You need to RESERVE YOUR ROOM TODAY or the next available hotel may be 20+ miles away. Seriously! Dates of the 2015 Palladium Open House (POH): May 15-17 (May 14 is VIP Thursday), 2015. $109.00 (plus tax) per night for two queen beds or one king with a sofa that has a pull-out sleeper. ALL rooms have a microwave & fridge, and FREE high-speed wired/wireless Internet. Call 734-455-8100 to make your reservation. The hotel does NOT charge your credit card until a few days before the event and you can cancel up to May 10, 2015. So there is no reason to wait. For more info and to purchase tickets to the Palladium Open House, click here. I mentioned last Weekly Update that we are putting together a directory of “Fan Favorite Stores” that carry Palladium products, and people are submitting them already. Awesome. We want people to know about the brick and mortar stores that you, our fan base, know, love and support. If the store carries Palladium products, we want to list them so our customers are able to find Palladium’s games wherever they live. These must be stores that carry Palladium Books products (even if it’s a small selection or new releases) and willing to order more when customers request them. Please post in this thread and list the store’s name, street address, telephone number, and website (if it has one). We’ll be creating a listing in alphabetical order by State or region and adding it to our website. That’s just one of many changes and features we’ll be making to the Palladium website in the coming weeks. I said it last week and I’ll say it again, if your local store is having problems getting Palladium product, tell them to call us. Palladium Books has 98% of its game titles in stock, in its warehouse, at all times! If the store is being told we are out of stock, it’s baloney! Tell the store to contact Palladium Books (734-721-2903) and we’ll help them get our products one way or another. That’s it for now . . .
Bizantium is done, The Rifter® #69 is in final production, and we are working away on all kinds of things for Robotech® RPG Tactics™ and other book releases. Like I said, this Update is only focusing on a handful of titles. More news and excitement to come. Enjoy your weekend and keep those imaginations burning bright. To the civilized world, Bizantium and the waters and lands around its are frightening. A realm of sea serpents, monsters, and barbarians. To the heroes and people who live there, it is a realm of adventure, beauty and opportunity. One might consider Bizantium as the center of adventure and mystery in the North. Many are the myths of ancient gods, lost treasures and strange creatures. On the mainland, there are the Wolfen and their canine kin, the Kiridin barbarians, the turbulent Shadow Coast colonies, and all manner of monsters and secrets in the Northern Hinterlands and Great Northern Mountains. Living near the edge of the Sea of Despair and in the shadow of the Land of the Damned, sea monsters and danger are but a short voyage away and make all too frequent a visit to the Bizantium islands. North of Bizantium is the Icy Ocean and Great Ice Shelf, places where only a handful of the bravest Bizantian sailors have ever set sail, and the rest of the world knows nothing about. For kingdoms in the south, only a few scholars have ever heard of the Great Ice Shelf or the cannibalistic Necromancers known as the Iceborn who make the frozen wasteland their home. Those who have heard tales of the land of ice and death are convinced they are nothing but the stuff of myth. Very soon, they will find out otherwise. And these are but a few of the revelations presented in Bizantium and the Northern Islands™. Discover for yourself the wonders and horrors that await. 192 pages – $24.95 retail – Cat. No. 474 – Ships March 25. The Rifter® #69 is packed with exciting and fun material for Rifts®, Chaos Earth®, After the Bomb®, Dead Reign®, Heroes Unlimited™ and more! Every issue of The Rifter® is an idea factory for players and Game Masters to generate new ideas and find new avenues of adventure. It provides useful, ready to go source material you can just drop into your ongoing games. A doorway to new possibilities and numerous Palladium role-playing worlds. And the many new characters, O.C.C.s, powers, magic, weapons, villains, monsters, adventures and ideas for one setting can be easily adapted to any Palladium setting. Every issue has material for Rifts® and at least 2-3 other Palladium game lines. With 2015 being the 25th Anniversary of Rifts®, every issue of The Rifter® will feature a Rifts® inspired cover and contain at least one Rifts® article. Rifts®: Arenas of Atlantis by Will Erwin. 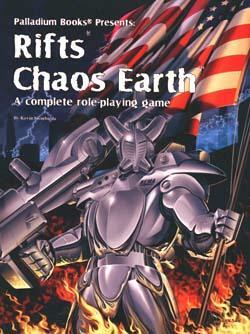 Rifts® Chaos Earth®: First Responders of New Mexico by Daniel Frederick. After the Bomb®: Long Gull Island by Michael J. Osborne. Heroes Unlimited™: Adventure ideas by Glen Evans. Dead Reign®: Tampa Bay by Eric Sturm. Game Master Tips by Chris Isberg. Rifts® Short Story: Clean, Part One, by Irvin Jackson. Rifts® cover by “Madman” Mike Leonard. 96 pages – $13.95 retail – Cat. No. 169. Winter issue. 64 pages – $12.95 – Cat. No. 662. Available now! 128 pages – $16.95 retail – Cat. No. 666. Winter/Spring 2015 (tentative). If you love Robotech®, you’ll want to take a look at this game. Beautifully detailed game pieces of your favorite Robotech® mecha, and fast playing rules that capture the Robotech® experience in a new, exciting way. And this is just the beginning. We have so much more planned. Available NOW – in game stores across the USA and Canada. Available in stores in the UK, European Union, Australia and New Zealand soon. ● Battle Foam Robotech® RPG Tactics™ bag/carrying case – Cat. No. 55107 – $120.00 retail (limited supply). Note: We only have about 50 Robotech® RPG Tactics™ Battle Foam bags available. Once they are sold out it will be months before we manufacture more, if ever. 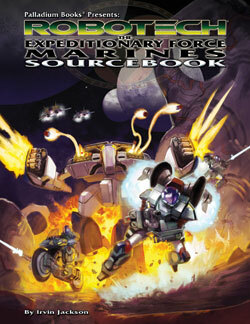 ● Robotech® RPG Tactics™ Rulebook – Cat. No. 55105 – $20.00 retail. Note: This is the same rulebook that is included in the main game box, and is offered separately for those who want an extra copy, or want to check out the rules before buying the whole game. 160 pages – $20.95 retail – Cat. No. 553. Spring. The Rifter® #49-60 recently added – available now.